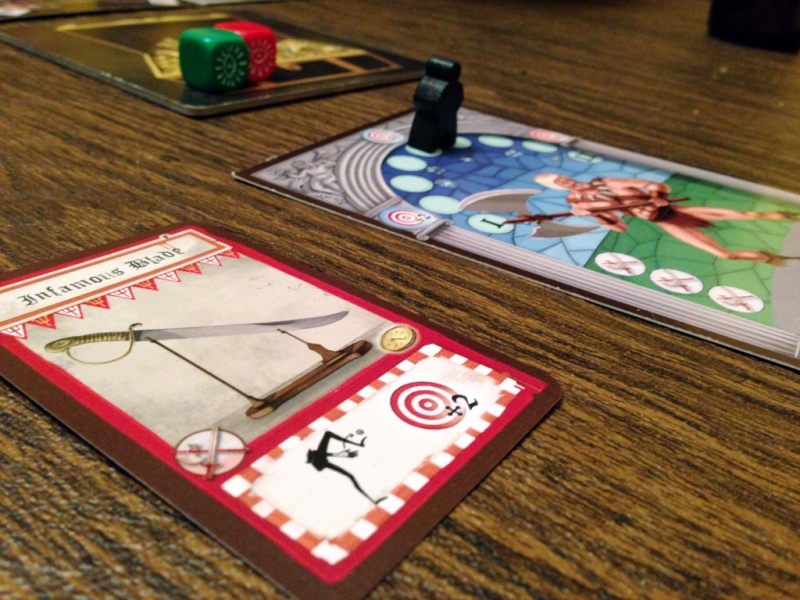 We review the board game Dungeon Fighter. This game combines cooperative play with a dexterity based dungeon crawler. Dungeon Fighter provides a unique twist on an old genre. The board gaming world has no shortage of dungeon crawlers. From heavy hitters like Descent 2e to lighter games like Dungeon!, there seems to be something for everybody. Catacombs introduced us to the idea of a dexterity based dungeon crawler and I’m happy to say that there is a new entry into the genre: Dungeon Fighter. Dungeon Fighter has just raised the bar for dexterity based dungeon crawlers. Dungeon Fighter will have you bouncing, jumping, spinning, bending and praying your way to victory…if you have the skills. Is Dungeon Fighter good enough to level up your gaming experience or should it be bounced off your table? Read on to find out! 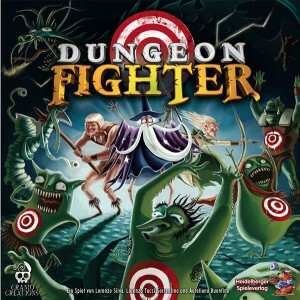 Dungeon Fighter is a cooperative, dexterity based dungeon crawler for 1-6 players. The game plays in about 45 minutes and is good with any amount of players. Dungeon Fighter contains a unique cast of characters, each with their own special abilities. In Dungeon Fighter, each player takes on the role of an iconic hero attempting to help his party make their way through the dungeon and slay the evil boss at the end. Players will progress through the dungeon encountering a new monster in each room. 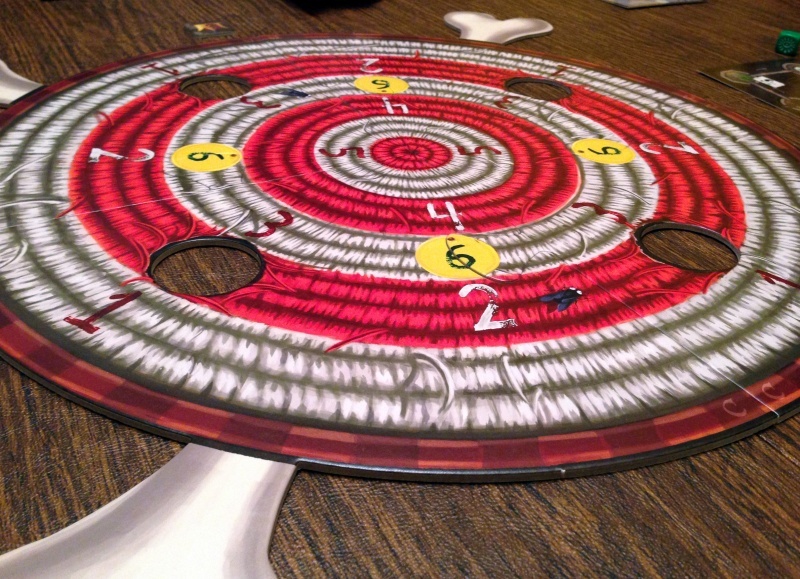 To continue through the dungeon, each monster must be slayed by bouncing dice onto a target game board. The more accurate you are, the more damage you will do. Each player will have 3 unique abilities to aid them in their quest. If the players aim is true, they will work their way through the dungeon’s 3 levels and slay the evil boss at the end. Do so and the players win. If everyone dies at the same time, then it’s game over. Dungeon Fighter did a fantastic job in creating their game. The components are all high quality and the artwork is just fantastic. To start with, you get a number of custom dice to throw around your gaming table. Each die is made with one of 4 different colors and has a unique symbol on a few sides. The focal point of the game will be the target board. It assembles from 4 separate pieces and has holes cut out throughout it. The game comes with a card holder tower that I felt was a nice touch. When assembled, it forms a 4 layer tower that will hold the cards to be drawn during the game. While the game designer could have just used piles of cards during the game, I feel that he went the extra mile in creating a thematic tower to use. Finally, the game also comes with a number of well illustrated cards, plastic coin tokens and card stock character sheets. The components of Dungeon Fighter are are a step ahead of what I was expecting to get with this game. For such a silly game, the production values where outstanding. Any gamer will get a lot of value with this box. This is your goal, the target board determines how much damage you do…if you can hit it. As far as dungeon crawlers go, the game play in Dungeon Fighter is fairly abstract. To setup the game, you must first assemble the tower, sort the cards, chose your hero, build your dungeon and assemble the dice target board. While it sounds like a lot to do, it’s actually not that bad. But it will take you a bit of time. Once that’s out of the way, it’s time to sling some dice. 1. Movement – Move your party from one room to the next. This is how you progress to the dungeons evil boss. There will be anywhere from 5-6 rooms per level to fight in (with different paths to take). 2. Encounter and fighting – This is where the bulk of the game happens. When you enter a room, you draw a monster to fight from the lowest level encounter deck. Each monster card will have a Name, Gold, Health, Damage and Special ability. To battle the monster, the starting player chooses one of the 3 colored dice and bounces it at the target board. That’s right, anyone who’s played beer pong in college will feel right at home here. A die must bounce once on the table and then land on the target board. If it does, the player inflicts a number of points of damage equal to the ring it landed on. If the throw misses the target, the player takes damage equal to the monsters damage value. If the die happens to land with the symbol side up (some powers require it to also land on the target), then the player can activate their special ability. These range from healing the party, to stealing gold, to inflicting more damage. If the player has done enough damage to kill the monster, then play moves on to the cleanup phase. If not, then the remaining 2 dice are passed the next player and he gets a throw. If the party goes through all 3 dice without killing the monster then they have 2 choices. Either use one of their one-time-use white dice (if they have any) or give the monster a free hit on everyone. If they choose the latter option then they get their 3 colored dice back and can continue with the battle. As you can see, aim really matters. I should note that some monsters will have special requirements, such as throwing with your eyes closed or behind your back. These range from silly to down right hard to accomplish. 3 Cleanup – After the monster is defeated the players can activate the room’s ability, if there is one. 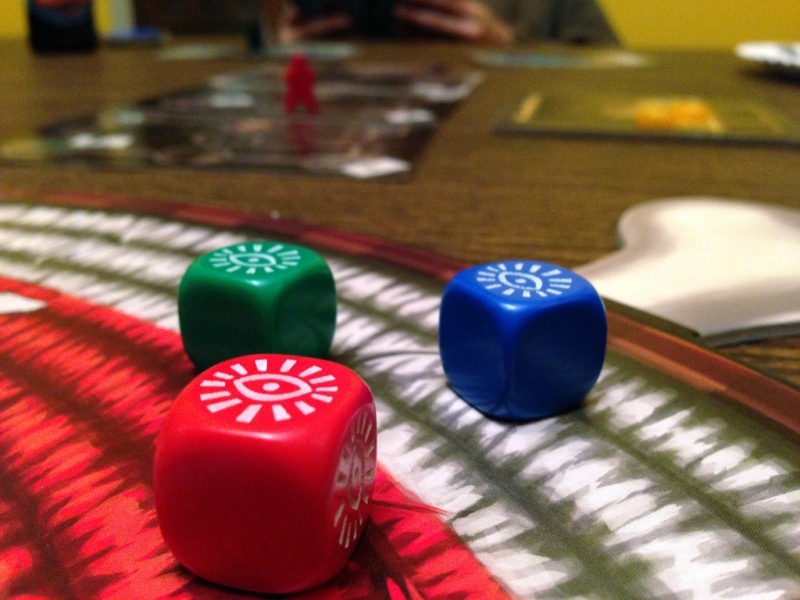 The starting player is then moved to the next person who collects the 3 colored dice to begin the next round. And that’s about it. Play continues in this fashion. As players accumulate gold, they will have the opportunity to buy items, potions and healing at various shops in the dungeon. If they can make it to the end boss and kill him, they win. If they are all ever knocked out, it’s game over. These are your weapons. If you can reliably hit the target with these dice, you’ll win the game. First off, if you are looking for a serious Dungeon Crawler, go ahead and move on. That is not even remotely what Dungeon Fighter is. What it is though, is a whole lot of silly fun. Dungeon Fighter will have you throwing dice over your back, jumping in a 180, banking dice off game boxes and “praying” dice onto the board. It’s fun, it’s silly and it’s not meant to be taken too seriously. I’d suggest playing with a few beers nearby. 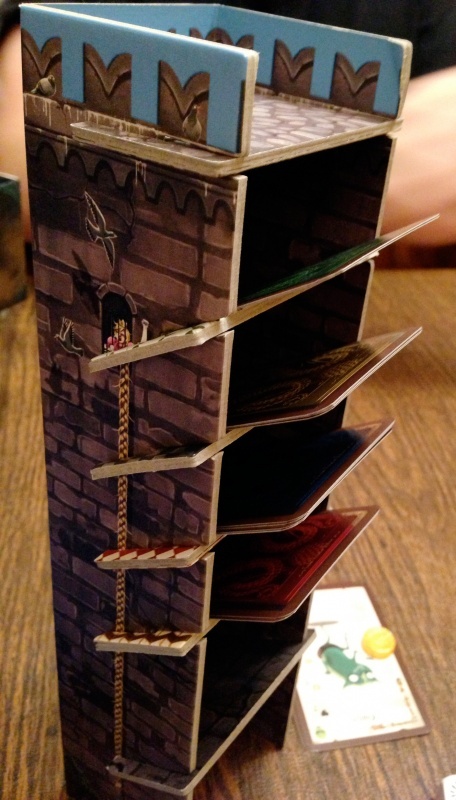 It’s nice touches, like this 3D card tower, that make Dungeon Fighter such a great game. Something Dungeon Fighter does really well is build a sense of camaraderie. In some coop games, one person can tend to act as the “quarterback” and direct other player’s actions. Not in Dungeon Fighter. You are all in this together and each person has to contribute, it’s the ultimate team game. One player may be an expert at chucking those dice, but he doesn’t get to make every throw. Each player will have to take a turn and all of them must do well for the party to survive. I really enjoyed that aspect of Dungeon Fighter. When you win, you know it was because you all pulled it off. There is something very satisfying about watching your friend make that perfect throw to kill the monster at the last minute. Much like in the game of craps, when someone wins, you all win. This is also a game where the components really help the experience. From the giant target board, to the 4 level card tower to the brightly colored dice, everything just screams quality. I really felt like I got my money’s worth with Dungeon Fighter. Everything is custom made, from the artwork to the dice to the game boards. 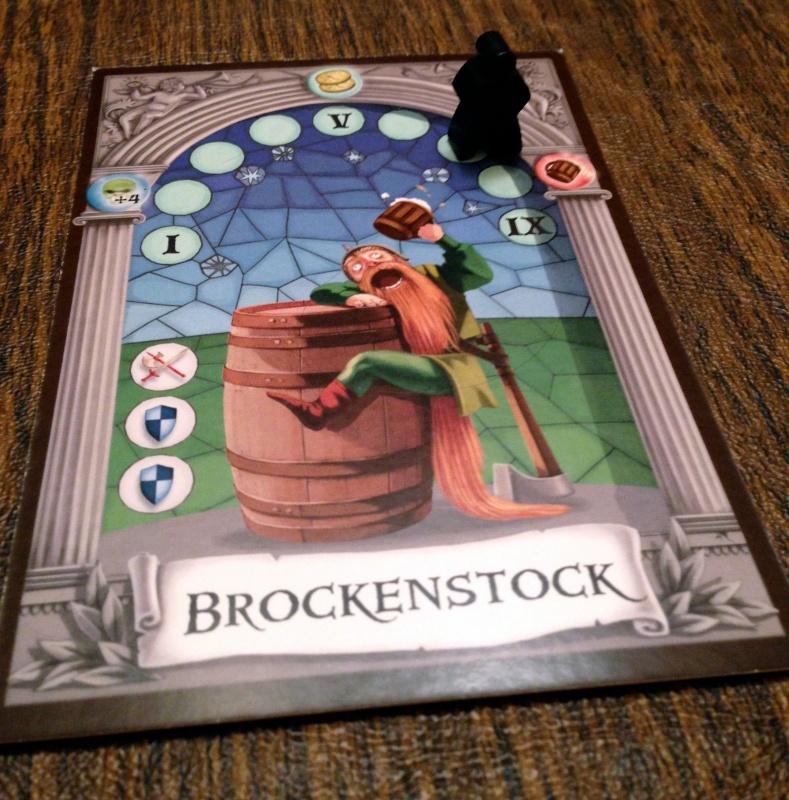 It makes the game experience a lot more satisfying when you have the full package of well designed game components. Dungeon Fighter does have some faults that I feel I should point out. One, you have to have the right table. You need a surface that hard (we tried playing on a padded table with disastrous results) and has enough space. You have to have enough room to bounce the die on the table before it hits the target. This shouldn’t be a problem for most people, but it’s something to keep in mind if you have a small gaming table. The other thing to note is that you will be bad at first. I would say that Dungeon Fighter would make a good party game, except that it’s not something everyone will be good at to start with. It really helps to practice those bounces. If your teammates can’t reliably hit the target, then you will lose. We didn’t make it very far on our first few games because we could not hit that target for the life of us. But after getting a little more experience throwing the dice (and a better table) we were able to pull off our first satisfying victory. Now when I play Dungeon Fighter we spend about 5 minutes at the start of the game just “warming up” on our dice throwing skills. Custom dice, artwork and tokens all come in this rather heavy box. But in the end of the day, Dungeon Fighter is a fun game. 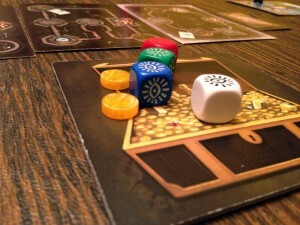 Throwing the dice at the board makes for a unique and enjoyable experience. The sense of teamwork it builds helps to make the minimal downtime go by rather quickly. Even if it’s not your turn to chuck the dice, you will still be watching intently to see what happens. After all, you’re all in this together. It also helps that the game isn’t bogged down with a heavy rule book. The rules are very easy to learn and the most players will be referencing the rulebook is for a symbol description that might be on a monster’s card. This helps a player’s turn to progress quickly. Gather your dice and give it a throw. It will help if you aren’t a very shy person as well as some of the required throwing positions can be a little silly. One last thing I really enjoyed was the special abilities of the characters. Each character has 3 special abilities, each of which corresponds to a colored dice. It was a nice touch that helps to add some strategy to the game. You have to be careful which die you chose as you don’t want to stop the next person in the turn order from being able to use their crucial power. There are a good amount of characters to choose from and this helps keep the game diverse and the replay value high. Both a win in my book. Players can purchase weapons, seen here, that will increase they damage they do. However using those weapons usually involves harder throws. And that’s Dungeon Fighter in a nutshell. It’s not your typical dungeon crawler game experience for sure. What it does do is take that genre and turn it on its head. While Catacombs was the first to combine the a dexterity game and a dungeon crawler, Dungeon Fighter took it to a whole new level. Dungeon Fighter is a wacky and sometimes frustrating game, but at the end of the day, it’s a whole lot of fun. 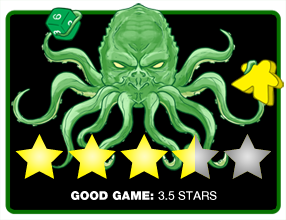 With the number of different room, monster cards (you won’t use all in each game) and player character choices, the replay value is extremely high. Oh, and until you master how to bounce those dice, you’ll want to play again and again. When you lose at Dungeon Fighter, you will immediately be overcome with a burning desire to try it again. I don’t know what it is about this game, but it almost feels as if it taunts you when you lose. I suppose that makes the victories all the more satisfying. This was a game I expected to be much better at then I was during my first few plays. But I was bad at first, really bad. The bright side is that didn’t diminish my enjoyment of the game in the slightest. That’s a mark of a really good game. When you can lose spectacularly and still want to play again. Dungeon Fighter comes with some outstanding components, great game play, a quick play time and is not bogged down with a complicated rulebook. If you are looking for a new take on the long established genre, I’d highly recommend giving Dungeon Fighter a look. It will be a nice break from the other heavy hitters out there. Final Score: 3.5 Stars– A great twist on an age old theme. Throwing dice around the room has never been so fun. I know it’s a pain, but I wish that when a game has the solo option, that there was a portion of a review which reflected how well the game played by yourself. However, your review of Dungeon Fighter was excellent and greatly detailed, so I can at least draw a great deal of info and how it “most likely” will play with one person. Many thanks!